Gondola outside corner sections connect two wall sections that are on the same level and must be equal in size. Not compatible with Double Sided Island Gondola Sections. Gondola corner sections mount into existing Gondola wall section components. Utilizes space while maintaining continuity around a corner. 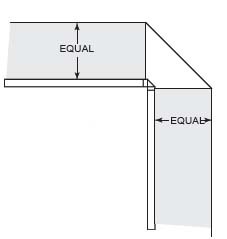 Shelf depth is approximately one third less than adjoining shelf depths. Separate bracket utilizes modified standard shelf components to maintain appearance, strength and simple installation. Sizes match all Standard Base and Upper Shelves. Outside available in 90 and 45 degree angles. Unique brackets on Standard Upright Side Panels allow part to be used on either side of Inside Corner using Standard Spanners and Back Panels. 4' width only. Separate bracket design utilizes modified Standard Shelf components to maintain appearance, strength and easy installation. Shelves do not accommodate wire or glass binning and may not be used in down slope position. Depths match all Standard Base and Upper Shelves.